This serum is a late addition to my favorites but I had to include it! Honestly, I received it in October and have used it every night all of November and December - every night! I usually switch through 3 or 4 night serums and this has made me not use anything else. Both months I did not get any hormonal breakouts and my skin has been super smooth. I absolutely thank this serum for that! So good - it is vegan, cruelty free and handmade by a small Calgary company - so amazing! (I did a full review on this serum here if you are interested). All I can say about this is GAME CHANGER! I received this in early Summer and I have used this every morning since! This is almost empty but my skin has been drastically improving since. Some mornings I will follow up with another serum and some mornings and others I will only use this under my moisturizer. It is amazing! If you are interested in seeing a full review, you can check out my past thoughts here! Another product that I have to say is amazing! This is both a moisturizer and an exfoliator that you use in the shower and it is everything! I never have time to myself in the shower anymore so I duel use products that actually work are fabulous! This exfoliates well and actually hydrates the skin so much that you do not need a moisturizer and my skin was smooth and soft all day! Also, it was much cuter to start off with but I'm almost through my first one! See how cute it is here! Skoah Masks - Hydradew, Klearity, & AHA ~ $38.00 - $48.00 full size. 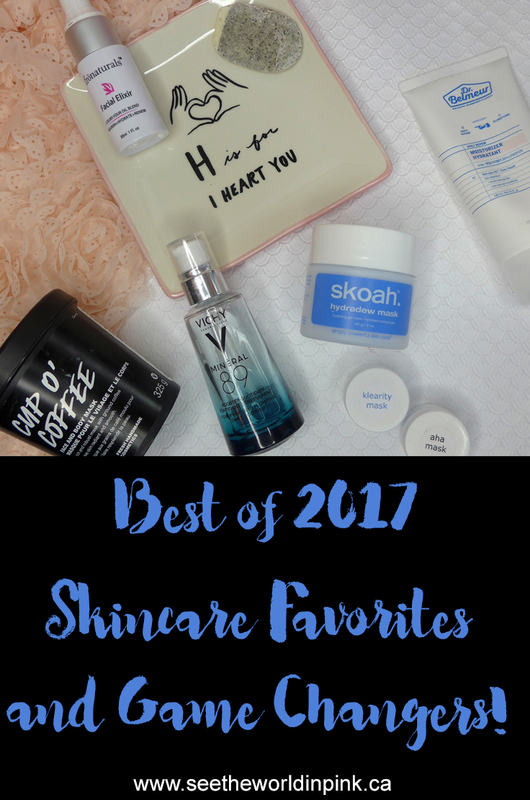 I use a ton of masks and probably could have included a few brands or masks; but, I had to talk about these Skoah masks because all 3 of these masks have been amazing on my skin! I had 2 facials this year with Skoah and absolutely loved what it did for my skin. I picked up a few masks and have felt the same way about all 3! The Hydradew (full review here) is a hydrating mask that is multipurpose mask - you can use it as a 10 minute rinse off mask, or leave it on overnight as an intensive mask, or I like to mix it in with my moisturizer for all day hydration! I love this - it is a must have in my skincare routine. When I went for my 2nd facial, they mixed AHA and Klearity together and it was amazing so I picked up a few samples to try it out at home and these are the only masks that I must use at least once a month! Klearity is great for oily/acne prone skin and is great for helping to prevent hormonal breakouts. The AHA mask uses alpha hydroxy acid to clear off dead skin - it is also infused with peppermint and smells amazing. These are amazing together! The Face Shop Dr. Belmeur Daily Repair Moisturizer ~ $32.00. A low-irritant moisturizer that calms sensitive skin and protects skin damaged by the external environment. Daily low-irritant moisturizing solution: Contains phytoshpingosine, moroheiya, birch tree sap and Skin-sync Rx™ which helps form a moisture layer to calm dry skin. This moisturizer has been really surprising to me - I really like it! The Daily Repair line is meant for dry, sensitive skin. This moisturizer has a gel-cream texture that is really nice on the skin. I thought that it would be best for Spring and Summer; but, I have been using this all Fall and Winter and it has been moisturizing so my skin is not dry at all (and I live in a cold, dry climate) but it doesn't feel heavy either so I find it really great for wearing makeup over top of too! Have you guys tried any of the same products as me this year? And, did you have the same results? I would love to hear your thoughts! Thank you Renee for your lovely feedback. The Facial Elixir is the culmination of a year's worth of testing to find the perfect facial oil formulation for everyday use. Only pure, organic, virgin coldpressed seed oils are used without the addition of any chemicals, fragrances or diluents. It has just worked so well - thanks for making a great serum!